Stepping into a compact elevator in London, Jazmyn McKoy ’17 took a deep breath. Flooded with anticipation, she reached the top floor of the building, walked down a hallway, and entered a little room, where she met the woman wearing all black. The woman was Cherie Blair, lawyer and wife of former Prime Minister of the United Kingdom Tony Blair. McKoy, then a high school student, had sent her a letter on a whim about her admiration of Blair’s philanthropic work, which led to their meeting. Blair’s words and strong support from McKoy’s mom inspired her to found Heart of Tabitha Foundation, an organization that motivates economically and socially disadvantaged young women to achieve their personal and career goals. The name comes from the biblical Tabitha, who did charitable work. “[Blair] was someone who encouraged me that when I have a dream, to pursue it,” she says. Growing up in Silver Spring, Md., McKoy founded Heart of Tabitha at age 16. She had benefited from similar organizations, which provided her with SAT prep, field trips, and dance classes. McKoy wanted to give those same opportunities to others, so Heart of Tabitha offers outreach in three categories for roughly 50 students, ages 14–21, each year: education, essentials, and health and wellness. Through these initiatives, the philanthropy has taken students on college tours, provided them with prom dresses, and taught them about breast cancer awareness. The initiative McKoy is most proud of, career discovery, allows young women to meet with professionals in their dream fields. “Hearing them say, ‘Wow, this was the first time I’ve ever talked to someone in this profession,’ and ‘I never would have thought of something like this before’ — that’s really inspiring,” McKoy says. Angelique Wong, now a Kent State University first-year student, is one of many young women who benefited from the organization. When she became involved with Heart of Tabitha about three years ago, Wong lacked direction. But the organization motivated her to become more involved with event planning, and Wong started a Black Student Union at her high school, inviting speakers whom she met through Heart of Tabitha. 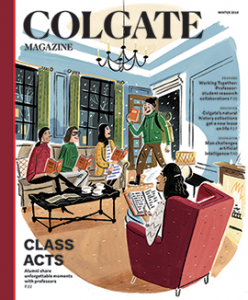 When McKoy came to Colgate, Heart of Tabitha’s board of directors took the lead on the organization while she contributed in her free time. She received summer funding from career services, which supported Heart of Tabitha’s first summer career discovery program in 2016. During her senior year, she was part of the Thought Into Action incubator and participated in Entrepreneurship Weekend. 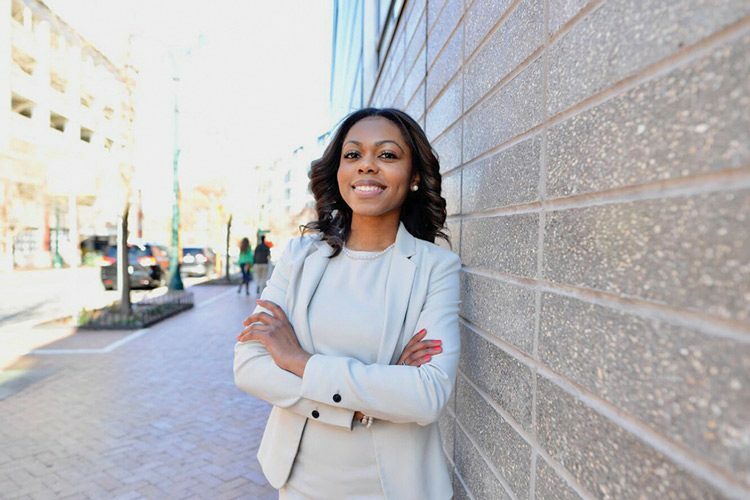 Today, McKoy takes an active role in event planning and programming when she isn’t at her full-time job as an assistant manager at M&T Bank in Potomac, Md. McKoy still thinks back to her time with Blair, but when she considers the future, there’s another woman at the forefront of her mind: Michelle Obama. Maybe McKoy will send her a letter too.